2 Olivet Church is the third of four structures to house its Episcopal congregation. The first, a log structure, was built on land given by Virginia Gunnell Scott of Bush Hill in 1853. A larger chapel, in the Gothic style, was dedicated in 1861. Both buildings were destroyed in the Civil War. In 1872 a new church was built at the corner of Bush Hill Drive and Franconia Road and may have been moved in 1892 to its present site. The new brick sanctuary was constructed in 1957. The steeple bell is from a steam locomotive, given by a parishioner when the engines were changed from steam to diesel fuel. Franconia Road at Beulah Street. 4 Oak Grove. Where the Sunrise Assisted Living facility now stands at Franconia Road and Frontier Drive was formerly the 19th century brick house occupied by the Broders family. Built c. 1825 by John H. Broders, a wing was added on c.1877 for a post office. Broders’ son-in-law William G. Moore was appointed postmaster and the office was given his name. The house was demolished in 1996 but the family cemetery still exists off nearby Elder Avenue. 6 Retirement. This plantation was given its name by Commodore Walter Brooke of the Virginia navy after he resigned in 1781. The 400 acre farm retained this name until the mid-1940s, when new owners enlarged the dwelling and encased it in ston. The Cohens then named it for themselves Ben-Mae Manor. Owned by the Fairfax County Park Authority, the house is now used as a community center for the Stoneybrooke subdivision. Located at 6715 Stoneybrooke Lane. 7 Huntley. Thompson F. Mason, grandson of George Mason of Gunston Hall, built this Federal villa c. 1825 as a summer retreat from his residence in Alexandria. Mason, a prominent lawyer, served four terms as mayor and was President of the Alexandria Canal Company and of the Middle Turnpike Company. The house, architecturally unique in the county, is listed on the National Register of Historic Places and is the center of an Historic District. It has been mothballed for future restoration by the Fairfax County Park Authority. Located at 6918 Harrison Lane. 9 Millan’s Tavern. James Millan and his wife Susanna are buried on their farm (Dairy Lodge), high on the hillside above the tavern site, which was located on Telegraph Road at Dogue Creek, just north of the Tartan Village subdivision. In 1822 the tavern was advertised as being on the Stage Road five miles from Alexandria formerly occupied by Hendley Nelson. The tavern was later used as a polling place for that precinct. 11 Hayfield. Home of Lund Washington, cousin of George Washington and manager of his estate during the Revolution. A late 19th century feature of the farm was its sixteen sided barn, a copy of one previously at Mount Vernon. The original house burned in 1916, but the barn and outbuildings remained until the Hayfield Farm subdivision was built. The barn burned in 1967. Located on Hayfield Road east of Telegraph Road. 13Laurel Grove Baptist Church and School. The church and the adjacent schoolhouse have served the African American community since their beginnings c. 1884. Many descendents of the Jasper and Carroll families still attend the church, while the school building has been restored by the Fried Company and will soon become a museum. Located at 6834 Beulah St.
14 Bush Hill. Constructed before 1795 by Alexandrian Josiah Watson, Bush Hill was next acquired by Richard Marshall Scott. He was serving in the House of Delegates when his first wife perished in the Richmond theatre fire in 1811. During the Civil War Gen. O.O. Howard, later the founder of Howard University had his headquarters on the grounds. In World War II the house was used for two years as a detention center for Hitler’s advisor Ernst “Putzi” Hanfstaengl. The brick house, later used as a nursery school, remained in the hands of descendents until it burned in 1977. Extensive archaeology was done on the site before townhouses were built. Formerly located inside the Beltway at the end of Bush Hill Road. 15 Clermont. Owned in the 18th century by the French and Dulany families, Clermont was later owned by Gen. John Mason, youngest son of George Mason of Gunston. After his death the plantation was purchased by Capt. French Forrest, USN, who became a Commodore in the Confederate Navy. The farm was confiscated as enemy property in the Civil War, and the dwelling used as a small pox hospital. It burned in 1865 while Union troops were decontaminating the structure. Formerly located just inside the Beltway on Clermont Drive. 16 Sharon Chapel. A chapel was built in 1849 on land donated by John J. Frobel of Wilton Hill. One of its early seminarians was Phillips Brooks, later the Bishop of Massachusetts and author of the hymn O Little Town of Bethlehem. Burned in 1864 by Union soldiers, the church was rebuilt using lumber from Fort Lyon and stood until 1903, when it was replaced by a third building. That chapel was demolished in 1971 after the present church was built. Located at 3421 Franconia Road. 17 Fort Lyon. Built in 1861, this was the second largest fort in the defenses of Washington, commanding the valleys of Hunting Creek and Telegraph Road. Its position on the plateau now occupied by the Huntington Metro Station afforded protection for the railroad, the Little River Turnpike and the city of Alexandria. In June 1863 the powder magazine exploded. The damage was so great President Lincoln came to inspect the aftermath. Until 1931 the fort was one of the best preserved around the Capitol, but suburban growth has left few traces. 18 Rose Hill. Home of Daniel French, Jr. builder of Pohick Church until his death in 1771. His tombstone, formerly on his front lawn, is now at that location. The house was named for the rose bushes planted on the three terraces before his house. In 1846 the plantation was owned by Maynadier Mason, the grandson of George Mason. The original house, located at 6412 May Boulevard, burned in 1895. 22 Flagg Hill. Acquired in 1853 by Benoni Wheat, whose daughter married Francis Triplett. The farmhouse remained in the family until the 1960s, when the tract became a gravel pit. Triplett Lane, which led to the house, is now known as South Van Dorn Street. The house site was behind Edison High School and is now part of the entrance to Kingstowne. 23 Carroll Town. A 19th century community of free African Americans on Old Telegraph Road between Hayfield and the U.S. Coast Guard Station. It was founded by the Carroll family, former slaves from the Hayfield and West Grove plantations. George Carroll, who lived until 1917, had a store where the Hayfield Shopping Center now stands. 24 Wards Corner. Located at the present site of the Crown gas station on Franconia Road at Old Rolling Road, this complex was once the heart of the Franconia neighborhood. Over a period of twenty-five years the center grew from a two-pump gas station to include a grocery store, a bar, movie theatre and dance hall. A fire on May 19,1959 destroyed this center of the community. 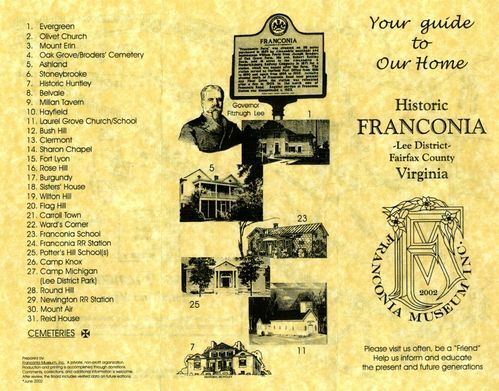 25 Franconia School. The first school was built in 1872, only two years after public education was mandated in Virginia. It was located on Old Franconia Road across from Potters Lane. When the present elementary school was built in the early 1930s the old building was sold (in 1935) for $75. It was used as a residence until it was torn down in 1986. 26 Franconia Station. Built in 1872 when the RF&P railroad was extended from Aquia Creek north to Washington. 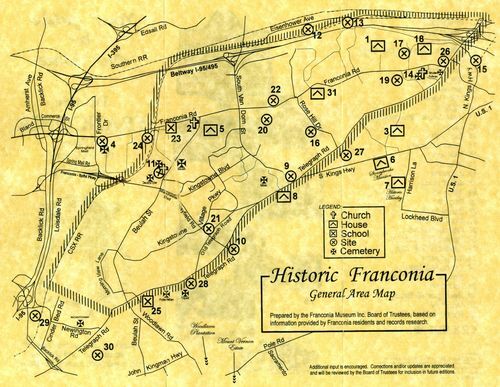 The station took its name from the Franconia farm of R.R. Fowle, whose land it crossed. Until service was discontinued in the early 1950’s the station and successor structures served an important role for commuting residents who worked in Washington. Located on Franconia Station Lane. 28 Potters Hill School. This school was successively located on three corners of the intersection on Telegraph Road at old Beulah Road. The land was acquired in November,1877 from Charles Potter. The building dedicated in March, 1917 burned in 1939. Miss Leila Milstead, who taught there for many years, provided pie parties, Easter egg hunts and taffy pulls for her pupils along with their formal education. A remnant of the first log school is said to be encapsulated within the walls of the Hilltop Landfill office at 2950 Telegraph Road. The land was first used as a chicken farm, then for mining sand and gravel before its most recent use. The frame house has been owned by the Gailliot family since 1917. 29 Camp Knox. The 3rd and 4th Maine and the 38th and 40th New York regiments camped here in the winter of 1861. Gen. John Sedgwick established his headquarters on Lawson’s Hill, which took its name from a former landowner. William Simms had purchased the land from Lawson in 1852. Cameron Methodist Church was built on part of the site at Franconia and Telegraph Road in 1963. 30 Camp Michigan. The exact location is unknown, but relics found near Lee District Park and the Stoneybrooke subdivision suggest that the 3rd and 5th Michigan Infantry as well the 37th New York may have been in this vicinity. 32 Newington. This tract was the glebe land of Truro Parish until 1765, and was subsequently owned by the McCartys and Chichesters until 1828. The Nevitt family then purchased the land. The house burned in 1875, but family members lived on part of the property through the 1960s. 35 Mount Air. Built in the 1730’s by Dennis McCarty, a member of the Virginia Assembly, much of the house was the Civil War, and Engineer Battalions camped there in WWI while they built a railroad spur into Camp Humphreys (Fort Belvoir}. The Engineers named their quarters “Camp Merry Widow” in honor of the owner of the estate. Part of the tract was confiscated in WWII to build Davison airfield. The house burned in 1993. The ruins, one of Fairfax County’s Historic Overlay Districts, are owned by the Park Authority.